In anticipation of goodies under the tree come Christmas morning, many take their wishes to paper. 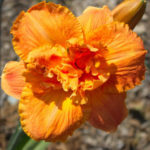 What is a daylily enthusiast hoping for this holiday? Plenty of daylilies to fill their garden of course. 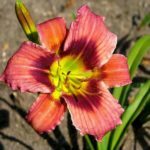 So, if you are looking for some daylilies to add to your existing collection, we have selected a few beauties you may want to include on your Christmas wish list this year. 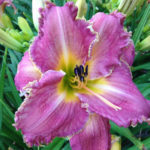 This sweet blossom is the perfect daylily to start your Christmas wish list. It is an extended bloomer that is orchid rose in color with a purple eyezone and a green throat. It is ruffled and has a flower diameter of 4”. Here is another lovely choice to add to your garden. Watson Park Pizzazz is a ruffled rebloomer with a cream butter overlay with light pink infusion and raspberry band above a green throat. The flower diameter is 5”. 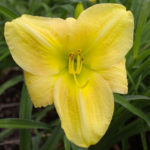 If you are seeking a fragrant daylily with a scrumptious name, this one is for you. In addition to its delicious namesake and fragrance, Blueberry Sauce boasts a deep lavender hue with white ruffled edging and a white mid-rib and green throat. Although this stunner belongs in the award-winning category, because it is very fragrant, we felt it was equally suited for this category. The magic amethyst is a ruffled rebloomer with an Amethyst lavender blend above a green throat. The flower diameter is 5.5”. Junior Citation 1997, Honorable Mention 2002. What a looker. This beauty will undoubtedly impress in your garden. 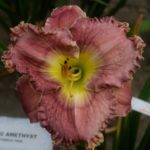 This double daylily is ruffled and recurved. It is a dark red self with a green throat. The flower diameter is 4”. Honorable Mention 1978. 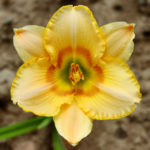 A double daylily and is fragrant? Yes. The best of both worlds are represented in this rebloomer. It is a soft coral orange self with a flower diameter of 5.5”. A three-time award-winning rebloomer. Ed Brown is a pink self with a gold edge and green throat. It is also recurved and heavily ruffled. The flower diameter is 5.5”. Honorable Mention 2000, Award of Merit 2003, and Stout Silver Medal 2006. 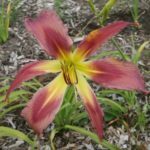 With a name like Brutus, you know you are getting a robust, bold daylily. This award winner is a blended yellow/green/flushed pink with a yellow-green throat. It is a ruffled, recurved extended bloomer. The flower diameter is 7”. Junior Citation 1975, Honorable Mention 1978. 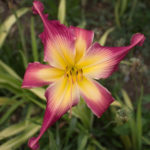 This beautiful spider daylily is an extended bloomer and has a flower diameter of 8”. It is lavender with a darker eye above a lavender throat. A perfect choice for any yard. 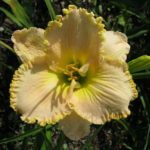 There is no question; the Lake Norman Spider daylily is the real deal. It is an award-winning, fragrant rebloomer that would make its presence known in any garden. The color is a rose-pink blend with a cream-green eyezone and green throat. Lake Norman Spider has pinched recurved petals and is also categorized as a UFO (Unusual Form). The flower diameter is 8”. Junior Citation 1981, Honorable Mention 1984. We are certain you have been good this year and imagine some of these daylilies will be included on your Christmas wish list. 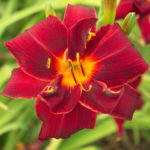 Here’s hoping you get everything you desire and that daylilies find their way into your garden next growing season.